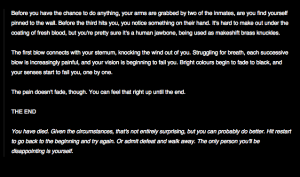 Over a year ago, I began working on my first major game project, an interactive fiction piece called No Way Out. In it, you play a prisoner on an orbital space station that has begun to fail. With no way to escape or even survive, the AI controlling the facility decides to release all the prisoners from their cells at once. Put simply, I believe No Way Out was a failure. Or rather, I think I failed to demonstrate or even make accessible what excited me about it as a project. I gleefully touted its word count, and its number of failure states, but never managed to express why that was something interesting. I mean, a choose your own adventure style experience that just has a lot of dead ends? That’s not interesting, that’s just bad design. See, I grew up devouring CYOA books. And I did what I think most people probably did. I left my finger in the page when making a choice. I changed my mind. I read passages out of order. I read through multiple times, trying to find the optimal path through. So when I designed No Way Out, I designed it with that in mind. The thing with IF is, it rarely takes the player/reader into account. It presents a series of choices, a set of guided paths through, and lets the player walk through. That’s fine, but I didn’t want to do that. NWO has as many fail states as it does because I want the player to go through multiple times. I want their experience to change based on what they’ve seen before. The game encourages you to try again, to play through knowing what the end result of those particular choices is. To this end, I made sure that the choices you make are consistent. There is no randomisation, no variable tracking, just choices. Even when you ‘win’, the game wants you to keep going. The end is not the end. Or at least, it’s not supposed to be. For starters, if you play through multiple paths, you are actually given conflicting information about the nature of the emergency and the state of the world. After reaching your third ‘ending’, you should have the sense that something is off. This is another major point of failure, I believe. I don’t think I actually made this apparent enough. In the end, that doesn’t matter, because as far as I can tell, the actual point, the real point of the game, doesn’t even work. It’s broken, and I have lost the original code. So, major failure there. Okay, I can do a little better than that. Every time you die, every time you ‘win’ and start again, you are playing through an alternate timeline. NWO exists across a fractured set of timelines, and as the player, you are at the convergence of several of them. Your memories carry over between timelines. There’s more to the story than that, but that’s the important part. So, why? Because I wanted to do what IF never does. I wanted to acknowledge the player. I wanted the meta-game to become part of the game. And, yes, I failed. Not just because it was broken, but because I didn’t make it apparent that you were even supposed to engage with the game in that way. I thought it would be a cool discovery for players to make, and maybe it would have been, if it had worked, and if I’d found a way to get more than a couple dozen people playing. So, where to next? Well, I’m still working on Little Witch Story, as well as some other projects. But at some point, I’d like to revisit NWO, and turn it into the product I wanted it to be. Of course, now I’ve spoiled all the good bits, but we’ll see. Maybe I can find some other way to make it clever. Games, Musings, Personal gamedev, games, IF, interactive fiction, No Way Out. permalink.